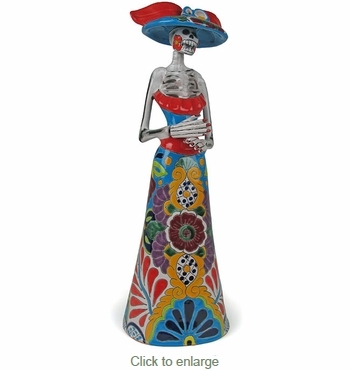 This colorful Talavera Catrina skeleton statue makes an excellent addition to your Day of the Dead display or just a unique item to display. Talavera pottery was introduced in Puebla, Mexico by immigrants from Talavera de la Reina, Spain and has remained a Mexican tradition for centuries. Our authentic Talavera statues are all handmade and hand painted in Mexico. We will carefully pack your order to ensure its safe arrival to you.